Adorable!! Love the hats:) Happy birthday Heather and Mr. K! Happy Birthday! Enjoy your day and all the days to come. They both have the same birthdays?? That's like having your b'day on Dec 25th or Feb 29th. You feel cheated. Happy b-day to you and Happy b'day to YOU. Kaci's rescue paper says her b'day is Feb 30th, that's REALLY bad. HaPpY BiRtHdAy HEATHER & MR K!!!! Sending you BIG licks and even BIGGER birthday wishes!!! Happy Birthday Heather & Mr. K! Here's to another awesome year!! Happy Birthday Mr. K and Heather!! Hootie says "I'll drink to that great toast to Mr. K and my sweet precious Heather! 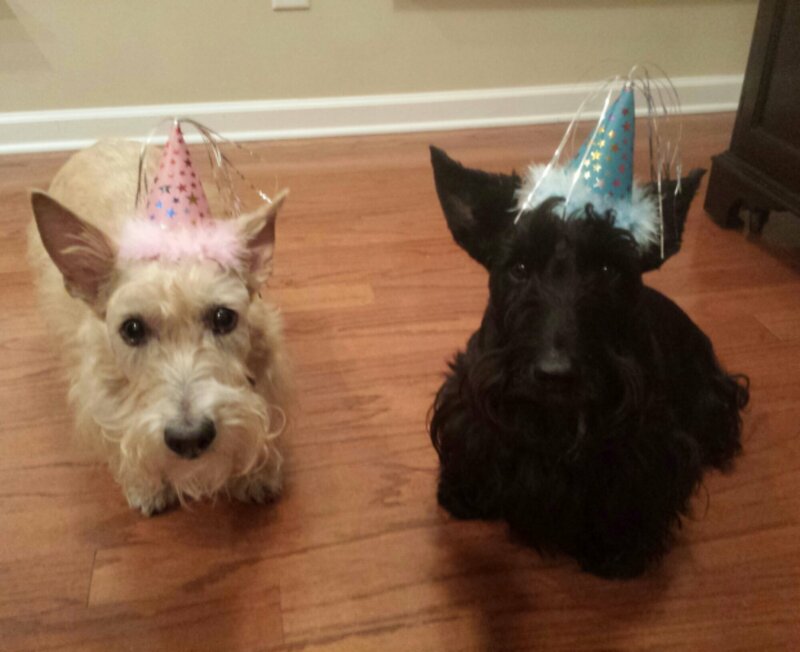 Happy birthday, kiddos!!!" Here's to you Mr K and Heather. May you have many many more fun filled years to come. Happy Birthday and many great times be had by all. Happy Birthday Heather and Mr. K! Have a super day with a lot of treats and love ... and maybe a bottle of Scotch ? Happy Happy Birthday and AAAaaaRRRrrrrrOOOOooooooo!!!!! From Shelby and the 4 Scots, Maddie, Marley, Chaplin and Spencer. Happy Birthday Mr. K and Heather! Wish I could have joined you for the Birthday celebration! I just turned 11 years old and I can tell you life gets better and is wonderful when you have loving peeps and good health! Best wishes and may you both have an awesome year to frolic and have fun! I hope they both had fabulous Barkdays! Hope you both had a fabulous day! Love the hats.